Happy Friday! Today a few of my sponsors have some lovely things to share with you, so you get not one, not two, but three posts in one day! What a way to start the weekend! So, let's start with something fun from Bean! This is Bean from Everyday Critter. I just started my blog at the beginning of the year and am already having such fun. 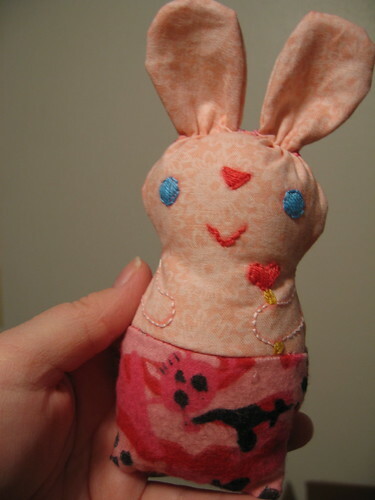 I am making an animal themed craft everyday of 2011. 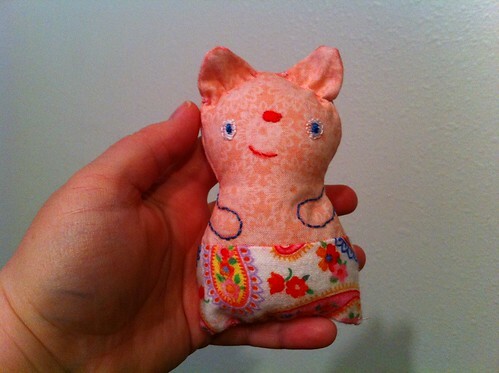 My newest endeavor is learning to make softies. I think I had two turn out cutely and one...well, one I learned a lot from. I'd like to give away one of my first attempts. To enter to win, go to Everyday Critter and look through my critters. Come back here and comment on which critter I made that you like best. A random winner will be chosen from the comments and you can pick which of the two softies you'd like me to send you. Thanks so much, Bean! This giveaway will remain open through Monday at Noon CST, so be sure to enter and spread the word. Who wouldn't want one of these cute critters?! Eeep! Aww, that's so sweet! They're really cute critters!! I really really like the cotton candy sheep! I love your blog and I'm excited to see more softies. Oh, this is tough! I like the Sleepy Kitty and the Octopi. I love the Valentine Octopus pair and the white dog best, though everything is lovely! What a fun project!! I love the Baby Sock Bunny! I love all your critters! Lovely blog. Toast Teddy was the most fun. Great project. I love the teensy Elephant! eek! so cute! My favorite is the pink flamingo....because you made it for me!! Green sleepy kitten is so cute!!! I would have to say the baby sock bunny is toooooo adorable! A fantastic way of using odd socks and incorporating embroidery as well :) Very sweet. Octopus love and sleepy kitten are soooo cute!!!!! Oh my goodness! They are all so adorable, but I think the little felt sleepy kitten based on the sleepy kittens from Despicable Me is my favorite! I like the Sleepy Kitten. I really like the awesome little monkey with the adorable baseball caps and the octopi! Look forward to seeing more softies! Thanks for the great give away!